At the start of this year, I said I wanted to write more about general experiences with less focus on just the outdoors. In early March, I went on my annual retreat into gaming culture, and I wanted to share some of it here. It’s not fishing or hiking in the mountain air, but it’s something that gives me a break from “real life” and fuels me in much the same way. I won’t spend time with background about Penny Arcade and PAX; you can easily google it if you’re curious. 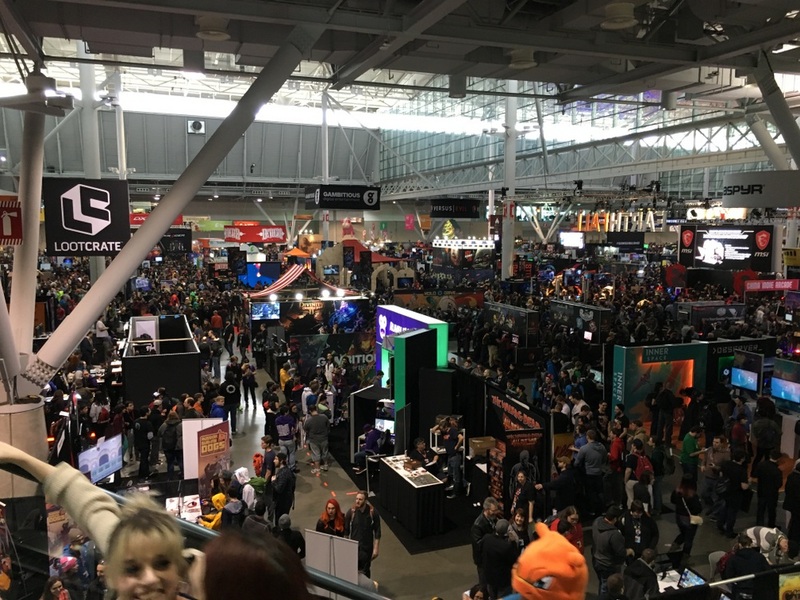 PAX is a unique convention in that it celebrates all aspects of gaming: board, dice, cards, role-playing, console, retro, PC — everything. It’s loaded with chances to play games, a massive expo hall with every game-related thing you can imagine, panels which discuss game topics, game-themed concerts, and more. 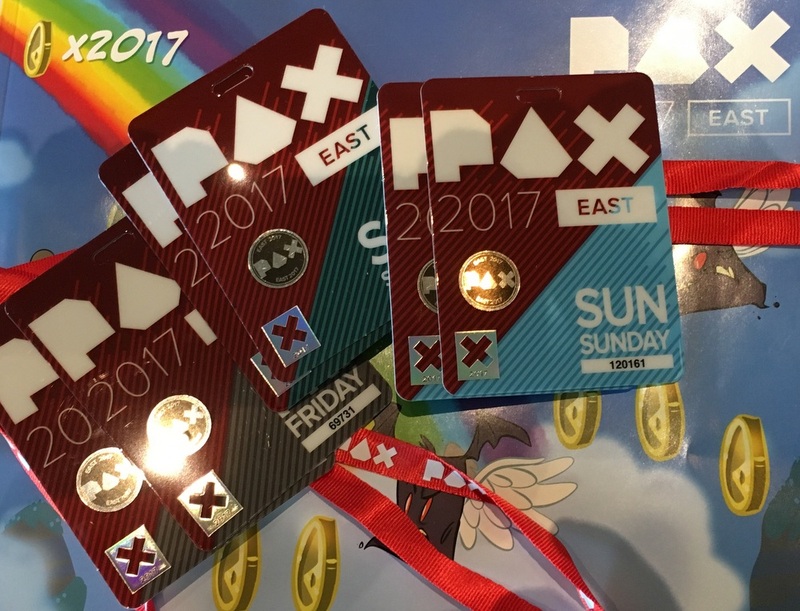 PAX East is their east coast convention and I’ve gone to every one since 2011. It’s a chance to reconnect with old friends, try out new games, and generally feel embedded in a culture which was once a major part of my life but which is now more of a footnote. While many people go there to play new titles before they come out, or to listen to famous speakers, my focus is more simple: I want to play board games with my friends, something that used to be a weekly thing, that turned into a monthly thing, that turned into a very rare thing. Life has a way of doing that to you. 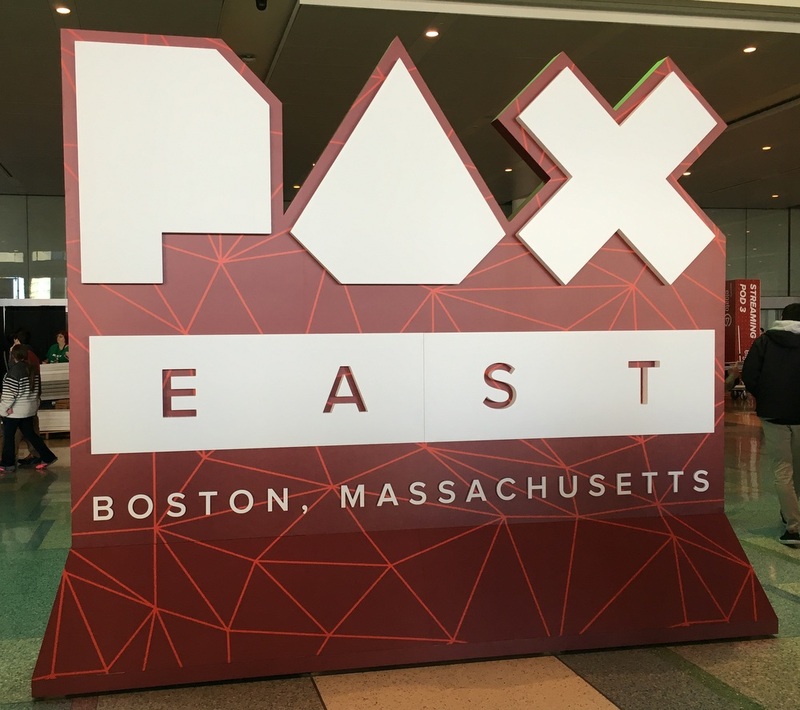 This year, as is tradition, I made the trip to Boston mid-day Thursday, the day before PAX began. My friend Clint joined me later in the day, and we grabbed a mediocre dinner at the Whiskey Priest and caught up. Usually, we have a few drinks and play a few games the night before. This year, we stayed at the excellent Seaport Hotel, which had a desk which wasn’t anchored to the floor or wall, and which doubled as a fine gaming table. So, we were able to set up a game of Mage Knight: The Board Game, a massive game which we’ve only played a few times due to its huge time and space investment. Over the course of probably 8 hours that weekend, though, we managed to complete a game. In the Mage Knight board game, players explore the countryside, revealing a semi-random map as they go. They defeat monsters, take over fortified keeps, hire companions, and learn new abilities which are acquired as cards. These go into the decks from which players’ hands are drawn. Playing the cards in your hand represents a single turn, and a game “day” ends when a player’s deck has been cycled. We play a co-operative variant where the objective is to explore far enough to reveal three powerful cities and conquer (liberate?) them before three full day/night cycles are played. It requires aggressive exploration so you don’t run out of time. But that leads to injuries (in the form of “dead” cards which accumulate in your deck) and passing up opportunities to increase in power. It’s a tough balance, racing against the clock, and we’d never “won” the game before. We managed it this time, and I’m not sure if the bottle of Irish Whiskey we consumed over the course of the game was a help or a hindrance. I’ll play Mage Knight every chance I get, but it’s gigantic, complex, and requires a time investment that scales with player count. But it’s well suited to a two-player cooperative game. Since it takes a good chunk of a day to play, times like this are when I get a shot at it. Prior to this PAX, I hadn’t seen the game in two years. Friday morning, we followed our usual plan of skipping as much of the lines outside the convention as possible. Life is short, and we’d rather play games at the hotel and arrive late than arrive early and stand around in the cold. 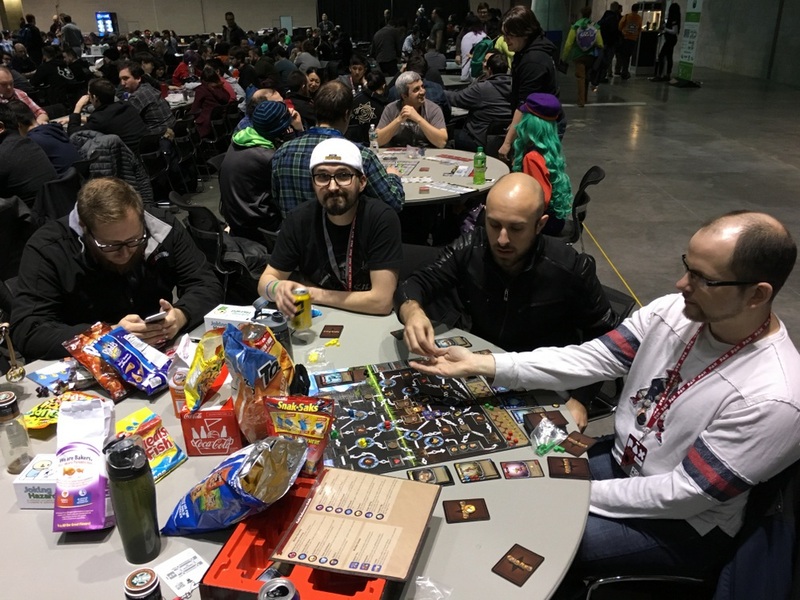 We immediately made our way to the “tabletop freeplay” area, where we snagged a table and met up with a handful of friends. While others settled in, Clint and I played a few rounds of 7 Wonders Duel, a two-player game based on the successful 7 Wonders franchise of board games. 7 Wonders is a ton of fun with between three and seven players, but plays awkwardly with only two. Duel captures much of the same fun mechanics of 7 Wonders but was designed from the ground up with a duel in mind. This was my first time playing it and I’ll be looking for excuses to play again; it’s fun, quick, and tightly focused. Choices are important, and randomness is limited to the initial card layout. While our friends played Space Trucker (a stupidly fun game where you build a spaceship out of tiles in a real-time frenzy of tile-grabbing, then “race” through random events which will likely cause your spaceship to be destroyed due to your poor design choices) we also tried out Hero Realms, a thinly-veiled fantasy reskin of Star Realms. It’s a fairly simple deck-building game with a shared market mechanic. It plays quickly but seems to have a high “swing” factor, i.e. games can quickly get out of hand with one player shifting the advantage quickly and earning a decisive victory in only a couple turns. I like Hero Realms, and Star Realms as well, but I don’t usually seek them out. Still, they’re a great way to introduce players to deckbuilding games with some fun flavor atop them. After that … time for lunch! We abandoned the overpriced long lines for convention center food in favor of the overpriced long lines for food truck food. The staff in this truck were listening to chiptunes covers and dancing while they served us — they definitely knew their audience. After lunch, we played some games from the lending library. 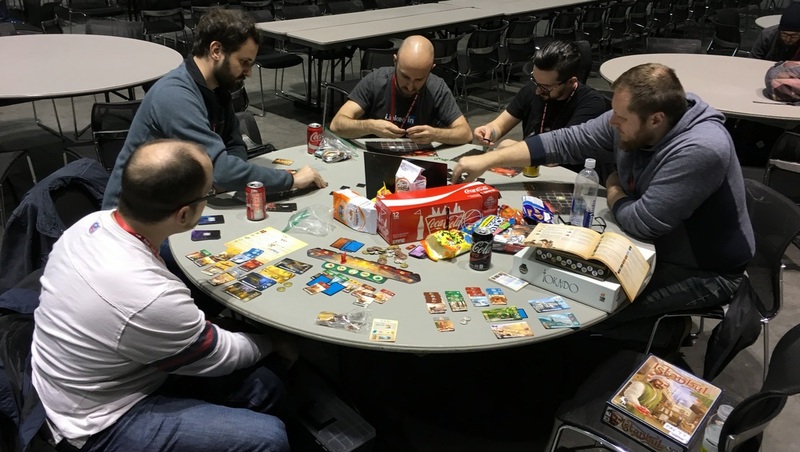 The lending library is one of my big reasons for coming to PAX — hundreds of games available to borrow, play, and return for free. They list them all online so you can plan a little ahead of time. I had a list of a dozen games I wanted to try and borrow — we didn’t get to all of them, but the initial research meant the ones we did play were great games. The first one we borrowed was my favorite of the convention, Istanbul. A “board” of 16 cards is laid out, with unique actions available at each card. Players move their merchant (and his assistants) around this board, trading for goods and trying to earn rubies. It looks very complex, but the play is simple and fast-paced, and your options are limited so your turns can’t drag on. The moving mechanic is innovative — you leave a trail of assistants behind you as you go, conducting business in your name. To take an action in a space, you either have to leave an assistant or pick one up. So you have to plan out how to move around such that you are not wasting movements, but constantly dropping off and picking up assistants to get your work done. It played great with either four or five players, and I hope to play it again sometime. But we weren’t done gaming yet! The next game we borrowed was Clank!, a lightweight deckbuilding dungeon exploring game. Navigate the dungeon, steal treasures, buy ability cards for your deck, and avoid making too much noise — because if you wake the dragon, you might not make it out alive. I loved the mood of this game and it captured several mechanics I really like in a single game. Unfortunately, we made a critical mistake in the rules that made it much too easy, and destroyed the inherent tension in the dragon attack mechanic. As such I can’t give it a really good review. I hope to play it again and correct my rules understanding. 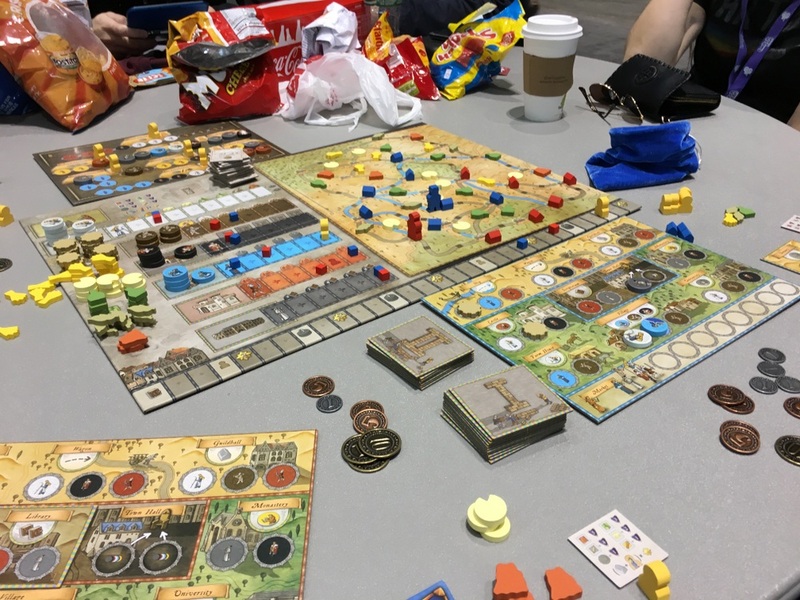 It was getting late by this time, but we found time to play one more game, which my friend Chris had brought to the convention. Lords of Scotland is a card game that feels very card-gamey, for lack of a better description. You pick up cards (that might be either face-up for face-down), play cards (again, either face-up or -down) to attempt to have the strongest play at the end of each round. You win rounds, accumulate points, and a winner is decided after several rounds. You can decide not to try and win a round but instead to play the lowest card and earn some bonus, you get bonuses for matching cards, and so on. It was fun and not overly complex and had a similar feel to playing a few hands of canasta or rummy, but with a cool Braveheart skin. 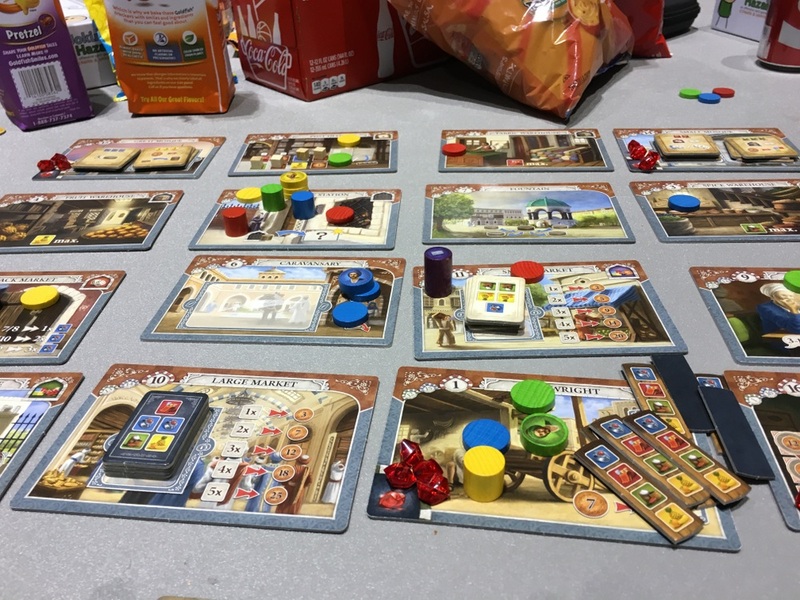 Orleans is a fantastic “bag building” game where you acquire follower tokens which get placed in a bag, and drawn out randomly to determine what you can do each round. It’s big and visually impressive but isn’t that complex to play. It makes me happy in the same way solving a puzzle makes me happy. Just something about figuring out what you can afford to buy each round with your followers “works” for me. I own the deluxe edition with beautiful wooden pieces and I’m always pleased to see it in play. 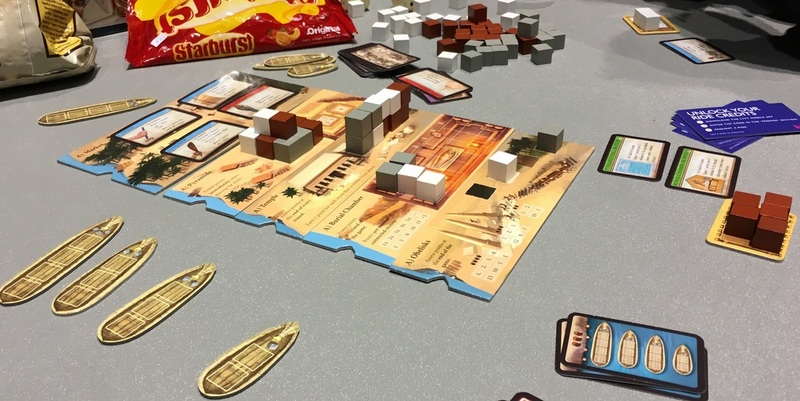 Imhoptep is a game where players compete to score the most points building structures in ancient Egypt. It’s a game where you can really mess with other players and a strong mix of planning, risk assessment, and knowing when to attack and when to defend are important. Citadels is a card game where each round you have a different role, chosen in a drafting fashion. You attempt to build up a city by playing cards, but the game play is different every round because the thief might steal all your gold, the assassin make you skip your turn, or the magician might steal your hand. There’s a lot of bluffing and social deduction but it feels more game-like than strict bluffing games like Resistance or Coup. The copy we played (from the library) was well-worn and obviously well-loved, and for good reason. 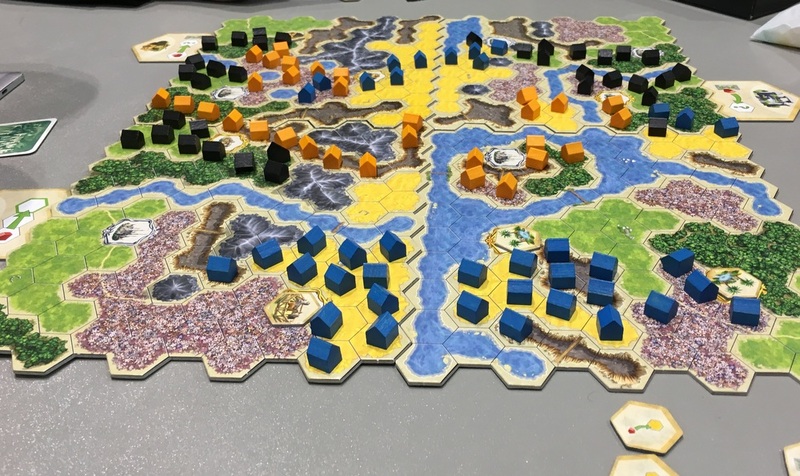 Kingdom Builder is deceptively simple area-control / route-building game where each round you play 3 tokens according to very strict rules, and accumulate abilities that let you bend those rules in interesting ways. Your choices become important early on, and the strategy gets deep very quickly. It blew us all away, about halfway through the game. “Oh, this is why everyone loves this game!” I wanted to play it again almost immediately, but we didn’t get a chance to. Sushi Go is a fun, lightweight set-collection/drafting game where you pass around the same hands of cards and try to accumulate the most points in 3 rounds of play. It’s simple and doesn’t hide much depth, which makes it perfect for introducing drafting mechanics to new players. I picked it up recently and everybody I’ve played it with has enjoyed it. Codenames is always fun; it was a big hit at last year’s con and I brought it again this year. In Codenames, you split into teams and one clue-giver tries to get the guessers to identify which words on the table are indicated by the clues that are given. You try to give a clue that matches multiple words — so you might give “green” for Mint, Bank, and Leprechaun. But you have to be careful — maybe they’ll also guess “House” which is the other team’s word…. It’s easy to teach and encourages creative thought. You always want to play one more round…. … And that was three days of gaming goodness! Mix in some walking around the expo hall looking at some new independent games coming out, eating questionable con food and drinking $3.50 sodas, and having a ton of fun catching up with old friends, and you’ve got my “Christmas” weekend. I begin looking forward to next year’s on the ride back home from Boston.